30 years, 9 months, 2 days old age. Carlos Brathwaite will turn 31 on 18 July, 2019. Only 2 months, 27 days, 22 hours, 5 minutes has left for his next birthday. Carlos Brathwaite has celebrated the total number of 30 birthdays till date. See the analysis by days count and bar graph. Carlos Brathwaite was born on 18-07-1988 in Christ Church, Barbados. He is a Barbadian-born West Indies Cricket Player. 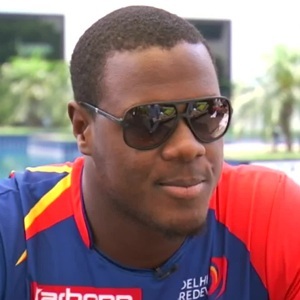 Carlos Brathwaite is a West Indian all-rounder who hails from Barbados. HE rose through the ranks after his maiden first-class season in the year 2011. He had a dream first class cricket debut in the match against T&T(Trinidad and Tobago) as he ended up with the figures of 7/90 in the 2nd innings of the match. Braithwaite since then showed some great consistency throughout the season and in the eight first class games that he played, he picked up 26 wickets. After a great first class season, he was given a national call-up and made his debut in a T20 match against Bangladesh in Dhaka. On the very same tour, he also made his ODI debut. Failing to make any impact in the two games that he played, he was dropped from the squad. After some significant performances against the Australians in the Test Series in 2015-16, he earned himself an IPL contract way above his base price of 30 lakhs and was finally bought by the IPL team Delhi Daredevils for a whopping 4.2 crores. He became a name to remember after hitting four back to back sixes in the final over of the World T20 2016 finals when West Indies needed 19 from the last over. His heroics in the final over handed West Indies their 2nd T20 title.